US Vice President Joe Biden said on Wednesday that the United States would take action against Iran - if its long-range ballistic missile tests widely reported in Iranian media were confirmed by the US. "I want to reiterate, as I know people still doubt, if in fact they break the (nuclear) deal, we will act," Biden said during a visit to Israel. "All their conventional activity outside the deal, which is still beyond the deal, we will and are attempting to act wherever we can find it." Iran fired two more long-range ballistic missiles on Wednesday as it continued military tests in defiance of US sanctions and fresh warnings from Washington. Coming just weeks after the implementation of Iran's nuclear deal with world powers, this week's multiple missile tests were described by Iran's powerful Revolutionary Guards as a show of force in the face of US pressure. After similar tests on Tuesday, Washington warned it could raise the issue with the UN Security Council and take further action after US sanctions were imposed in connection with Iran's missile program in January. Even as it tested its nuclear-capable missiles, IRGC chief Maj. Gen. Mohammad Ali Jafari on Tuesday said Israel is "in range of most of our missiles." The missile tests are part of an ongoing stance of hostility towards the West by Tehran, and come in breach of UN resolutions and US sanctions. The controversial nuclear deal saw international sanctions lifted in a windfall for the leading state sponsor of terror, but did not extend to limiting Iran's missile program. 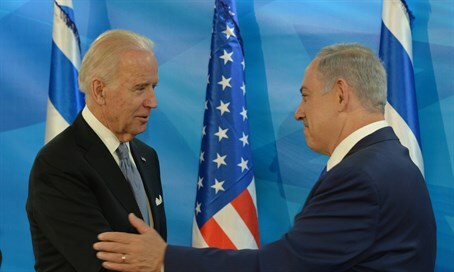 Biden spoke after meeting Israeli Prime Minister Binyamin Netanyahu, who forcefully opposed the nuclear accord with Iran, which has long vowed to destroy Israel.